Some people have a way of expressing their thoughts which can turn into what seems like rambling or even ranting. They go on and on about the details and it isn’t always easy for people to follow the speed in which they express things. 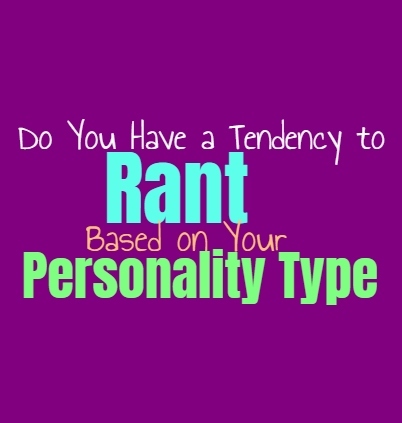 Here is how much you rant, based on your personality type. INFJs don’t usually go on long rants since they do want to hear how people are responding to them. They are more likely to rant when they are really passionate or worked up about something. INFJs are more likely to do this when they are around someone they trust and feel comfortable expressing themselves with. INFJs do become excited or upset about certain things and feel the need to go on a rant expressing their thoughts and feelings. There is so much going on inside of the INFJ, and so they often need to let this out to the right people. ENFJs do sometimes go on rants and find themselves rambling a bit when they get worked up about something. They are sometimes chatty people and so when they become passionate or excited they find themselves becoming more expressive. They try to keep certain details to themselves so they don’t cause too much discord, but ENFJs do have a tendency to go on rants when they are feeling overwhelmed and really just need to let things out and express themselves and their stress. INFPs do sometimes go on rants when they are sincerely worked up about something, especially the things they are most passionate about. They don’t like feeling as if they are being overboard, but INFPs follow what feels right for them. Often their rants come when someone has pushed too far, or when they feel like a situation is truly immoral and just wrong. They need to express how they are feeling and so sometimes going on a long rant and just unloading is helpful for them. ENFPs do sometimes go on rants when they are really frustrated or worked up about something. They can go off on tangents and sometimes it is difficult for others to really follow or make sense of it. For the ENFP their words make complete sense but they bounce around a lot and not everyone is capable of keeping up with their train of thought. ENFPs do go on rants to express themselves and sometimes this happens when they are happy or angry about something. INTJs aren’t really likely to go on emotional rants, but they can find themselves explaining a point for a long time in an aggressive manner. Sometimes their explanation and desire to make others understand their point, can seem a bit more like a rant. Most of the time INTJs are able to keep things to themselves and don’t need to express themselves in a ranting manner. They aren’t ones to be open about their emotions, and so when they are angry or upset they often prefer to be on their own. ENTJs don’t really like ranting in a way that expresses their emotions, but they do occasionally do this. When someone is being truly inefficient and leaving the ENTJ feeling annoyed and overwhelmed. They sometimes need someone they can rant to in order to express their thoughts and frustrations in this situation. ENTJs have a lot going on inside of their minds and they find themselves becoming angry at how inefficient and ignorant some people can be. When they are feeling this way they might need to go on a bit of a rant, in order to make sense of it all. INTPs do go on rants, sometimes to a point where it seems like they are rambling. While things might not seem to make sense to others, the INTP knows exactly what they are trying to express. They simply have very active inner minds and can bounce around from one topic to the next quickly. People cannot always follow the thought pattern of the INTP, since some things might get lost in the process. They do sometimes feel like going on rants about subjects, since there is so much going on inside of their heads. ENTPs do sometimes go on rants, especially when they are worked up about something. They might appear to be rambling sometimes, since people cannot always follow their thought process easily. ENTPs can bounce around from one thing to the next, seeing the patterns and connections along the way. This is simply how their minds work, and not everyone is capable of keeping up with this type of thinking. For the ENTP ranting can sometimes be a way to express their thoughts, even though not everyone can really keep up. ISTJs are more focused on improvement and getting things done than they are on ranting. When they are annoyed they can express this frustration clearly and set boundaries, but don’t want to have to elaborate. For the ISTJ going on rants means they have reached a serious breaking point with someone and they need to really lay down the facts of the situation. They would rather express their points logically and precisely, and focus on doing their own work. ESTJs do sometimes go on rants when they are really worked up about something. They have a tendency to get going on a subject, especially when they feel like someone is being inefficient. They need to be able to express their frustrations and sometimes they need to find a way to make their rant heard. When ESTJs feel like ranting it is because they are sincerely annoyed and feeling like someone is behaving rudely or foolishly. ISFJs don’t like to rant in a way that might upset someone, so they can often keep these feelings to themselves. They don’t want to express themselves in a way that might upset or bother someone else. ISFJs who are feeling like going on a rant will only do this around someone they deeply trust and rely on. They do enjoy having someone they can confide in when they need to really express a thought or feeling in great detail. ESFJs do sometimes go on rants but this is usually when they are angry with someone and need to really get it out. They do need to be able to express when they are very frustrated, and so they will rant about something in a way that can go off in different directions. ESFJs also ramble when they are excited about something and this can seem a bit like they are ranting about a subject. They enjoy having people they can chat with and they become very passionate about their projects or hobbies. ISTPs don’t really like ranting unless they are talking about a thought or idea they are excited about. They do sometimes go on tangents when they are trying to explain an idea to someone they trust. For the ISTP it can be nice to have someone who can keep up with their thoughts and the different theories they are trying to really analyze and figure out. ESTPs definitely go on rants, sometimes lasting for a while. They enjoy being able to express themselves and get excited when someone is willing to listen to them. ESTPs sometimes seem to ramble when they are going on these long rants, jumping in all different directions with their descriptions an idea. They enjoy being able to go off on tangents in order to express their thoughts and excitement about something, or even when they are annoyed with a situation. ISFPs do sometimes go on rants but only around people they trust and can confide in. For the ISFP it can feel weird to rant about something to people who don’t really understand them or their feelings. They do enjoy being able to express their thoughts though, and sometimes this leads to a bit of a rant on their part. They want to hear what the other person has to say of course, but for a while it can be nice to just feel heard. ESFPs are definitely the ranting type, and they enjoy being able to express themselves. They want to have people who are willing to listen to them when they are feeling a strong emotion. ESFPs have a hard time holding things in and really need to be able to go on rants, or really just ramble about different ideas for a while. When they have someone willing to listen it makes them feel sincerely loved and appreciated.